Millions of acres of Alaskan rainforest are now protected from highly damaging development. A federal judge in Alaska ruled recently that 9.5 million roadless acres in southeast Alaska’s Tongass National Forest will be offlimits to logging and road construction. The judge’s decision restores federal protection to one of the largest remaining unspoiled temperate rainforests in the world. This land had received protection in 2001 when the U.S. Forest Service issued the Roadless Area Conservation Rule to protect the nation’s last expanses of truly wild lands from development. However, in 2003, the Bush administration bowed to logging interests and exempted the Tongass National Forest from the Roadless Rule. But the Roadless Rule is needed to protect this extraordinary area, with its towering groves of ancient trees and its vibrant populations of grizzlies, wolves, eagles, and salmon. The construction of roads crisscrossing the area would seriously disrupt natural ecosystems. “As the realities of global climate change become ever more apparent, the critical need to preserve these last remaining, intact roadless areas within the national forests could not be more urgent,” wrote a group of leading scientists in support of ending the exemption of the Roadless Rule in the Tongass. “I like to pull up my hood and stand close to a tree trunk in a rainstorm and watch the progress of the flood. “The first droplets sink into the bark like rain into thirsty soil, the corky layers absorbing moisture. Then the gullies of the bark are filled to overflowing, until the water leaves their banks and sheets over the entire surface. Miniature Niagaras form over ledges in the bark, sweeping bits of lichen and helpless mites in the torrent. Passing over twig and branch it picks up sediment along the way. Dust, insect frass, microscopic debris, all are swept along, dissolving in the water so that stemflow is far richer in nutrients than the pure rainwater from which it began. Today, March 22, 2011, is World Water Day, designated by the United Nations. Water covers about 70% of the earth’s surface. Ours is indeed a watery planet. The overall amount of water on our planet has remained the same for about two billion years. Water moves around the planet in a water cycle. The cycle has five parts: evaporation, condensation, precipitation, infiltration, and surface run-off. In a 100-year period, a water molecule spends 98 years in the ocean, 20 months as ice, about two weeks in lakes and rivers, and less than a week in the atmosphere! Groundwater can take a human lifetime just to travel a single mile. Water is a key factor in regulating the earth’s temperature. Water is the only substance found naturally on the earth in all three states–solid, liquid, and gas. Frozen water is 9% lighter than liquid water, which explains why ice floats on water. Of all the water on earth, only 2.5% is fresh water. Fresh water is either groundwater or more accessible water in lakes, streams, and rivers. The deep ocean current moves around the planet in a 1,000 year cycle, enriching nutrient-depleted surface waters by carrying them through deeper layers where nutrients are abundant. 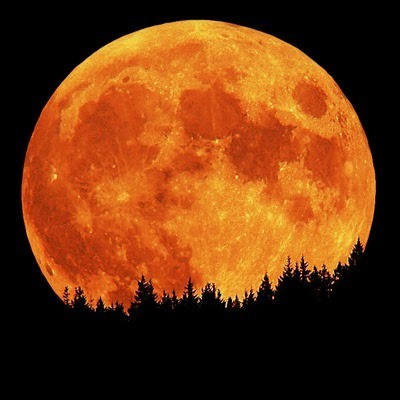 Tomorrow, March 19, will be a full moon. But it will be more than a full moon; it will be a Super Full Moon. Scientists say it will appear larger than any full moon has since March 1993. When the moon rises in the east at sundown tomorrow, it will appear unusually big and close. Full moons vary in size because of the oval shape of the moon’s orbit. The closest point of its orbit, the perigee, is about 50,000 km closer to the earth than is the farthest point, the apogee. Tomorrow’s full moon takes place less than an hour away from perigee, a near perfect coincidence that happens only once every 18 years or so. for his long high arc in tribute to the earth. she will never sing again if you are unwilling to listen. like the falling spring moon, are completely alone. In just 11 days, you can do something very easy to join with millions around the world in a call for action for a sustainable planet. You can participate in Earth Hour. On Saturday evening, March 26, from 8:30-9:30 pm, just shut off the lights. The darkness you create will be part of a greater darkness throughout your time zone. Each of the world’s 24 time zones will ‘go dark’ in turn, creating a rolling darkness that circles the planet. Millions of people will be turning out the lights in their homes, businesses, and wherever they are. 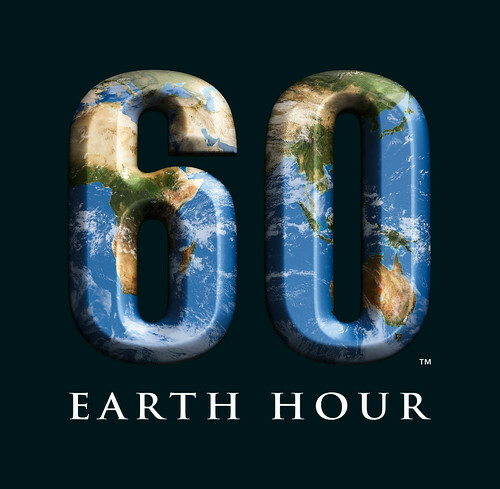 Major landmarks such as the Sydney Harbour Bridge in Australia, the Eiffel Tower in France, and the Gateway of India in Mumbai will also go dark during Earth Hour. Earth Hour was launched in 2007 in Australia. That year, more than 2.2 million people in Sydney and 2,000 businesses turned their lights out for an hour to take a stand against climate change. By the next year, Earth Hour had become a sustainability movement with more than 50 million people in 35 countries participating. That year, such global landmarks as the CN Tower in Toronto, the Golden Gate Bridge in San Francisco, and Rome’s colosseum all stood in darkness, “as symbols of hope for a cause that grows more urgent by the hour,” according to www.EarthHour.org. In 2009, Earth Hour spread to more than 4,000 cities in 88 countries, making Earth Hour 2009 the world’s largest climate change initiative thus far. And Earth Hour 2010 was bigger still, with actions in a record 128 countries. “People across the world from all walks of life turned off their lights and came together in celebration and contemplation of the one thing we all have in common–our planet,” www.EarthHour.org reports. This year marks the fifth anniversary of Earth Hour. Organizers are asking the millions who will be participating to look beyond the hour, to think of what they might do after the lights go back on to make a difference. I think Earth Hour sounds like fun. Many climate change and other environmental groups will be sponsoring public events that will hearten participants and increase public attention to this most urgent cause. Since time is short, and I am very busy these days, I am thinking about hosting a very small event in our home, perhaps a dessert gathering by candlelight. I think of it as a chance to participate in the global event, and also a time to increase understanding, hope, and commitment, even among a few people. on sturdy little toothpick chickadee legs. and takes a sunflower seed in its hard black mouth. 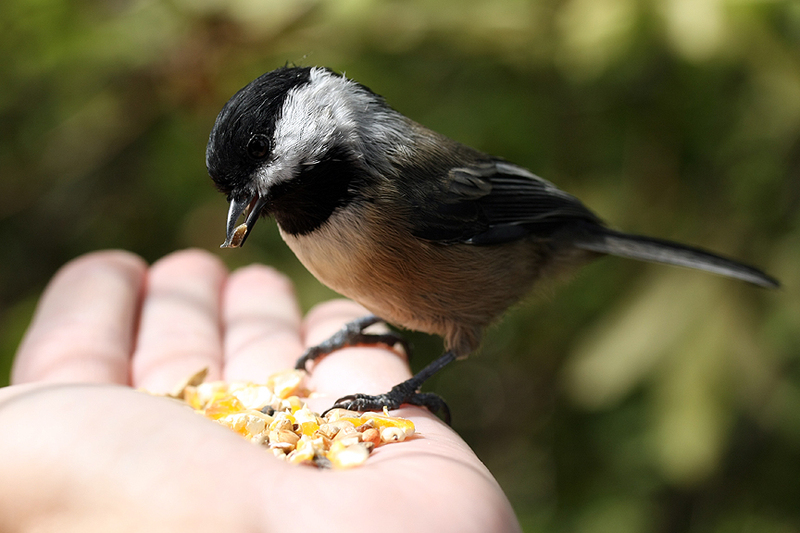 than let the chickadee feet have their way with you. Back in the 1970s, there was not a black-footed ferret to be found anywhere on America’s vast western plains. Once numbering in the hundreds of thousands, this small mammal had kept the population of the prairie dog, its only prey, in check. But after decades of ranchers’ successful efforts to exterminate the prairie dog, the ferret population also plummeted. 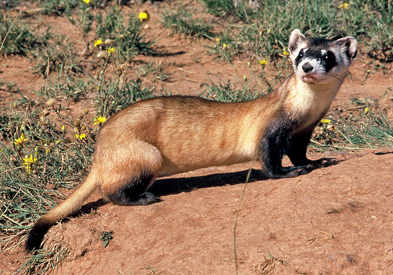 By the 1970s, scientists feared the black-footed ferret had become extinct. Then in 1981, a Wyoming ranch dog brought home something that shocked everyone. He had captured a black-footed ferret! Scientists rushed to the area and searched for more ferrets. Eventually, more than 120 of the bandit-masked creatures were discovered. For a few years, this Wyoming ferret population seemed to hold their own. But after dozens of them succumbed to disease in 1985, researchers began capturing the remaining animals to keep them in a safe facility. Within just a couple of years, only 18 were left. Then came a second chance for North America’s only native ferret species. The animal became the focus of a multi-state, captive breeding and release program sponsored by the U.S. Fish & Wildlife Service, state agencies, and other organizations. No young were born that first year. But then came a male named Scarface, who saved the day. He sired litter after litter of healthy kits, reports the National Wildlife Federation, which bought time, while scientists figured out what they needed to do to enable this little-studied animal to survive and thrive. Preparing young ferrets, or kits, born in captivity for life in the wild involves preconditioning. Because black-footed ferrets make their homes in prairie dog burrows, the young ferrets are exposed to natural prairie dog burrow systems and prairie dog prey during the ferrets’ early developmental stages. The young ferrets are placed in large, outdoor pens for extended periods. This process significantly increases the animals’ chance of survival once released into the wild. Today, 30 years after the black-footed ferret’s rediscovery, about 500 of the little mammals are living in the wild in Wyoming, Montana, South Dakota, Colorado, Utah, New Mexico, Arizona, and Mexico. Hundreds more are living in captivity and will later be released. 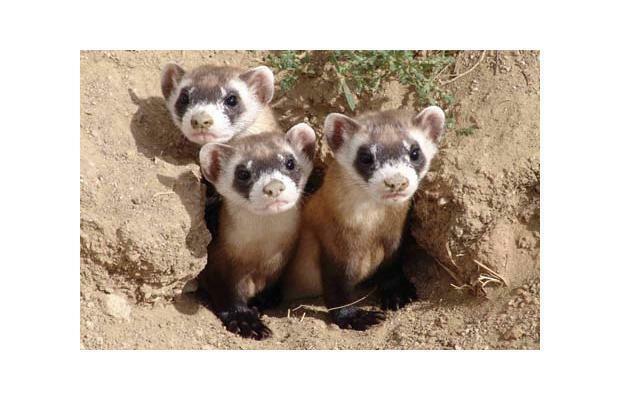 “Ferret recovery has been a huge success story,” says Mike Lockhart, the U.S. Fish & Wildlife Service biologist who coordinates the recovery program at the National Black-footed Ferret Conservation Center near Fort Collins, Colorado. Lockhart is hopeful that the black-footed ferret will rebound in great enough numbers that it can be removed from the Endangered Species List. That goal will be achieved, Lockhart explains, when there are at least 1,500 ferrets living in 10 locations, with at least 30 breeding adults in each population. It’s looking good for the ferret. Of the 19 reintroduction sites around the west, successful reproduction has been documented at all but two. About half of the sites are considered ‘successful’ or ‘improving.’ Successful sites are those that are self-sustaining, with at least 30 breeding adults. Improving sites have growing populations, but have not yet reached sustainability. Black-footed ferrets are 18-24 inches long, including a 5-6 inch tail. Their short, sleek fur is pale yellow. They have a black ‘face mask’ and black feet. Nocturnal and elusive, black-footed ferrets spend about 90% of their time underground. When I stepped out onto the deck yesterday morning, my body didn’t do its habitual bracing-against-the-cold thing. The air was not winter-cold. Instead, it was early spring-cold, brisk and full of promise. The forest beckoned, and I strolled down the hill among the trees. How the green needles of the pine trees shone in that bright, chilly sunshine. Bright red buds dotted the tips of a red maple’s branches. And the corkscrew willow had greened considerably, I realized, since the last time I’d noticed it. Sitting on one of my favorite logs, I mused on another early March morning about 30 years ago. Why I still recall that day, I don’t know. But I remember walking on a Washington, DC street, impatient with that early spring chill in the air. Though glad that winter had ended, I wanted it to be spring–now! My ability to enjoy that transition time, when winter is receding, and the sun is just gaining its strength, was small, compared to my longing for truly warm weather. A few months ago, scientists discovered a ‘new’ frog! So tiny, only the size of a pea when full-grown, this diminutive creature is the second smallest frog in the world. Although specimens of the little creature have been seen in museums for more than 100 years, they had been misidentified as juveniles of other species. The ‘new’ frog, called Microhyla nepenthicola, was discovered living in and around pitcher plants in a national park on the Southeast Asian island of Borneo. In studying the newly discovered frog, scientists have learned that the male Microhyla nepenthicola frogs gather at dusk in and around the pitcher plants and ‘sing.’ Their ‘song’ is a series of harsh, rasping notes that last for a few minutes, followed by brief intervals of silence. Scientists have also learned that the females deposit their eggs on the pitcher plants’ sides, and the tadpoles grow in liquid that accumulates inside the plant. The pitcher plant that supports the tiny frog is one of many carnivorous pitcher plant species in Borneo. The pitcher plants where the tiny frogs were discovered were at the edge of a road leading to the summit of a mountain inside Borneo’s Kubah National Park. 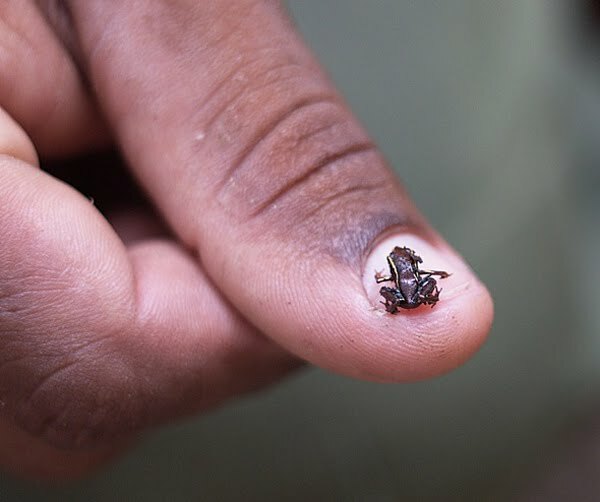 The search that led to the discovery of these minuscule frogs is part of an effort by Conservation International (CI) and the International Union for Conservation of Nature. These two organizations are sending teams of scientists to 20 countries on five continents in search of 100 species of ‘lost’ amphibians. These are amphibians that are considered potentially extinct, but that may be holding on in a few remote places. Amphibians are a highly threatened group of animals, with about a third of them in danger of extinction. Scientists hope that this search will help them to understand the recent amphibian extinction crisis. You are currently browsing the Earth Connection blog archives for March, 2011.